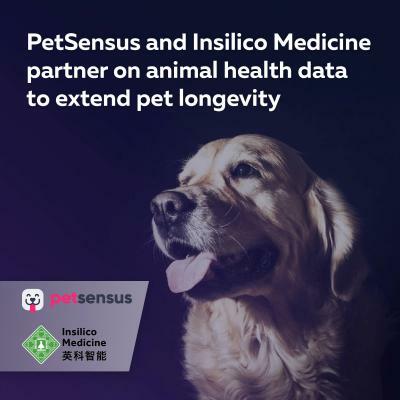 Tuesday, April 16, 2019 – Animal biomedical data start-up PetSensus and Insilico Medicine, a company specializing in the application of deep learning for target identification and drug discovery in humans, announce a collaboration in animal longevity. Around the world pets are often considered members of the family and there is an increasing awareness of their health and wellbeing which has many economic and emotional benefits. More than 95% of Americans view their pets as family, and spend increasing amounts of money on personalized nutrition and care. At the same time, pet health indicators such as the incidence of obesity, diabetes and dental disease are at historic highs, affecting eight in every ten cats and dogs. In fact, cancer is a leading cause of death among dogs, even though it is treatable in half of all cases if diagnosed early on. Unfortunately, due to the high costs of drug development and absence of reimbursement mechanisms, drug discovery research in animals intended to extend healthy productive longevity is stalling. In order to accelerate the development of innovative interventions in the aging of pets and service animals using the latest advances in artificial intelligence, a large amount of multi-modal animal health data will be required. PetSensus seeks to address this issue with its biomedical data platform. Big data analytics can generate predictive insights quicker, cheaper and more accurately than the millions of animal tests conducted each year. AI holds the key to radically reducing the amount of animal testing taking place, while simultaneously returning far greater benefit to human health. “Innovative companies such as Insilico Medicine leverage the power of AI to achieve what the pharma industry takes years, thousands of employees and millions of dollars to achieve. We want to bring the same capabilities to animal health,” said Martin Razuks-Ebels, founder and CEO of PetSensus. While Insilico Medicine’s impressive list of partners already spans several Big Pharma, biotechnology and academic partnerships, the partnership with PetSensus will unlock new possibilities in animal health. “Not only can our experience from the human industry be translated to the animal space, but the new findings from the animal industry will likewise be applicable in areas of human health. Humans and dogs share around 82% of the same genes, while that number is as high as 90% for cats, which entails a lot of potential overlap in illnesses,” said Alex Zhavoronkov, founder and CEO of Insilico Medicine. “While it is old news that pet owners live happier and healthier lives, PetSensus will empower pet owners to step up to the task and play a central role in improving their pets’ as well as their own well-being in the long-term,” said Razuks-Ebels, CEO of Petsensus. Insilico Medicine, Inc. is an artificial intelligence company with R&D and management resources in Belgium, Russia, UK, Taiwan and Korea. The company and its scientists are dedicated to extending human productive longevity and transforming every step of the drug discovery and drug development process through excellence in biomarker discovery, drug development, digital medicine and aging research. Insilico pioneered the applications of generative adversarial networks (GANs) and reinforcement learning for generation of novel molecular structures for diseases with a known target as well as those with no known targets. In addition to collaborations with large pharmaceutical companies, the company is pursuing internal drug discovery programs in cancer, dermatological diseases, fibrosis, Parkinson’s Disease, Alzheimer’s Disease, ALS, diabetes, sarcopenia, and aging. PetSensus is a Latvia-based animal biomedical data start-up that unites pet owners and pet care companies to improve pet wellness and longevity. The blockchain-connected platform uses deep veterinary knowledge and AI tools to generate personalized pet care insights on the basis of each pet’s unique biomedical data. Research organizations, on the other hand, obtain access to this live population dataset, trial target recruitment tools, and on-demand cutting-edge analytics tools to enable a new era of research and development in pet wellness that rivals human healthcare.